The JLL IC300 PRO Indoor Cycling Exercise Bike is a fantastic piece of exercise equipment which is perfect for users and athletes who are looking to take exercise sessions to the next level. It is a follow up model of the JLL IC300. This bike has been reported to be one of the best in the United Kingdom and other parts of the world. It is designed to be compatible with riders of different needs and abilities. The JLL IC300 PRO suits all exercise needs. It is perfect for toning muscles, burning calories and improving cardiac health just from the comfort of the home. 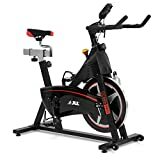 The JLL IC300 PRO Indoor Cycling Exercise Bike is designed with certain unconventional features such as its magnetic resistance and built-in pulse sensor. Users should make no mistake in thinking the bike is the same as the IC300. It stands apart from it. It has an easy-to-use LCD monitor. The monitor of the exercise bike makes it very possible for the rider to keep track of their workout figures as they ride. The monitor will help to keep track of speed, time, distance, pulse, RPM and pulse rates. All these readings will make it easier to maintain cycling intensity and assess workout sessions. 12 Months home use warranty only, ROHS CE compliance. Maximum user weight is 130kg. Unique Handlebars: This indoor exercise bike is designed with special handlebars which have built-in pulse sensors. Large Flywheel: The indoor bike has a larger flywheel than what is commonly found on other bikes. Crank pedals: The bike is designed with 3 crank pedals that allow for a very stable riding experience. Unique Pulse Sensor Handlebars: The JLL IC300 PRO is designed with two handlebars which also serve as pulse sensors. These easily reachable pulse sensors allow for the accurate measurement of pulse rates and heart rates of rides when cycling. This is vital for riders who are sticking to workout programs that demand that they maintain a specific target heart rate. Large 20kg Flywheel: This indoor bike features a flywheel larger than those of other bikes. This flywheel is heavier than that of the standard JLL IC300 model. The larger flywheel is designed to offer a wider range of resistance. The experience gotten from this large flywheel can be a challenge to even the best athletes and riders. Magnetic Resistance: Unlike other models of the JLL IC range, the JLL IC300 PRO makes use of a magnetic resistance. This helps to increase the longevity of the bike requiring less maintenance over time. It also helps to reduce the noise coming from the bikes even when riding at maximum settings. Adjustable seat and Handlebars: For increased comfort while riding for long periods, it is vital that the seat is adjustable. The JLL IC300 PRO Indoor Cycling Exercise Bike is useful to different riders of all shapes and sizes due to its adjustable seat and handlebars. The saddle offers about 6 levels of horizontal and 10 levels of vertical adjustability. 3 Crank Pedals: For a very stable riding experience, the JLL IC300 PRO utilizes the 3 crank pedal technology. The pedal possesses built-in toe cages for a firmer grip when cycling. This allows for harder cycling without slipping. Transport Wheels: To allow for easy transport of the bike around the home, it is fitted with built-in transport wheels. In order to use them, simply tilt the bike forward and you can move it to a more convenient location before or after workout. Comfort and Stability: The comfort and stability offered by the JLL IC300 indoor bike is unparalleled. This means that every rider is able to work out effectively and efficiently. Easy to assemble: The assembly of the JLL IC300 PRO is said to take a maximum time of about 25 minutes to complete. Weight: Certain riders and athletes have found the JLL IC300 PRO heavy and somehow difficult to transport. The conveyance wheel work perfectly when moving it between adjacent rooms but in going up the stair, seeking help may be the best option. The JLL IC300 PRO Indoor Cycling Exercise Bike almost has it all and this makes it a perfect choice for different riders. It is a fantastic bike that is able to suit the needs of every rider that desires to get the best out of a workout session.